Classic instruments : Use up to 8 Xils-lab thick and musical oscillator wave forms per patch and shapes them with the double filter structure. The main unit uses Xils-lab 3rd generation zero-delay feedback filter with self-oscillation in each mode while the second offers a vocal formant mode in addition to high-pass, band-pass and low-pass modes. Serial only protected: Oxium is protected by a simple serial, without the need of any hardware dongle or challenge response. Two skins to fit with your mood. Fully loaded with more than 250 presets made by talented and known sound designers (included Lotuzia, Nori Ubukata, Tzadi, Ingo Weidner, Sami Rabia "AiynZahev", Stephen Wey, Simon Ball "Soundsdivine", Kelvin Ford). 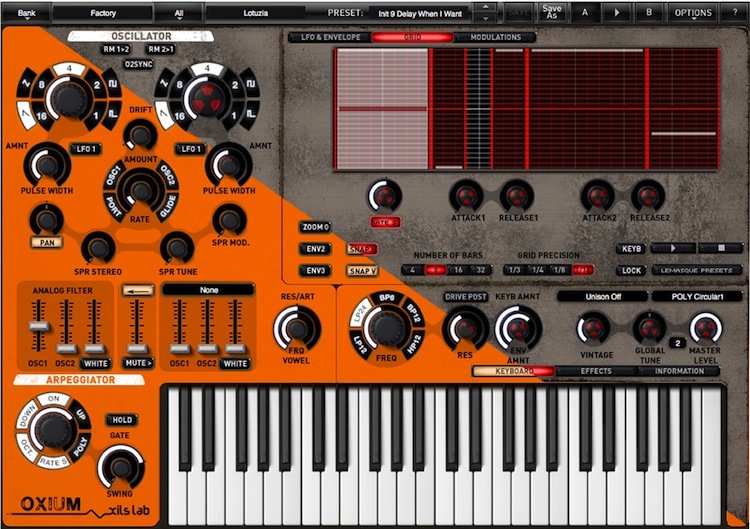 Synthesizer by XILS-lab$99.00In My Cart! XR.A.M.S.E.S.